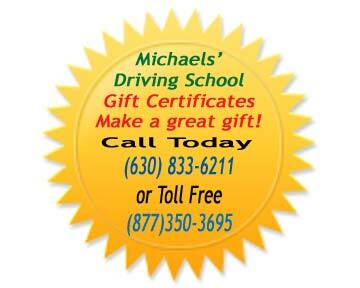 Michaels Driving School offers classes at each of its four locations. The classroom phase will require approximately four weeks. Our course fulfills the requirements of the Secretary Of State for obtaining a "Certificate of Completion" (Blue Card). Monday - Thursday from 9:00 A.M. til 11:00 A.M.
Monday - Thursday from 11:00 A.M. til 1:00 P.M.
Monday - Thursday from 1:00 P.M. til 3:00 P.M.
Monday - Thursday from 4:30 P.M. til 6:30 P.M.
Monday - Thursday from 6:30 P.M. til 8:30 P.M.
A $195.00 deposit is required to reserve your seat. Our EZ payment plan allows the balance to be paid in four additional payments of equal amounts. It will take four to five weeks to complete (depending on starting date). Payment may be made by cash, check or bank credit card. All deposits are non-refundable but are transferable. deposits received in timely manner will guarantee a seat. Fees/Starting and finishing dates are subject to change without notice.